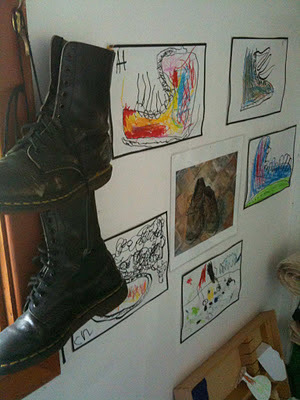 Allow children to draw, sing, talk, act, make things, dress up and so on. Provide opportunities for response to things they experience, hear, read and view. Offer rich experiences that encourage them to find out, seek solutions and solve problems. 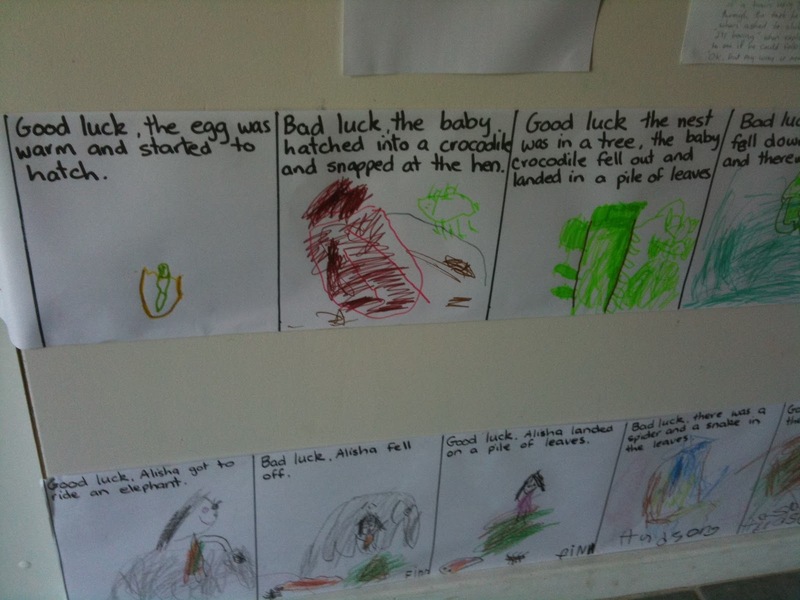 Encourage rich use of language, word play, rhyme, song, counting games etc. Give frequent opportunities for children to read and be read to. 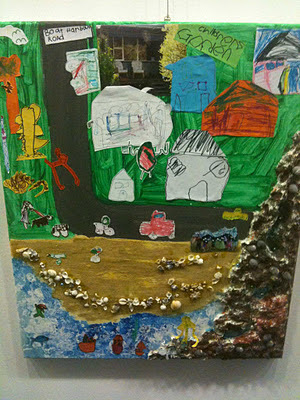 Provides time for children to explore their world within the confines of a safe space that has supervised boundaries. Offer lots of opportunities for both structured and unstructured play. 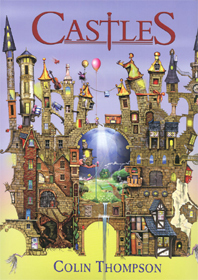 Give fantasy an important place through books, film craft and inventive play situations. 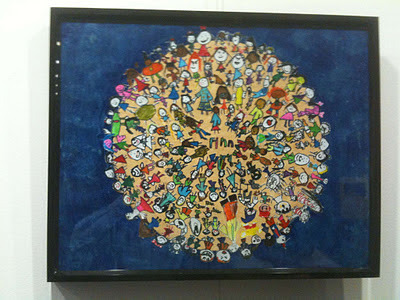 This is Finn's representation of the world and its diverse people. Finn (aged 5) drew the pictures and planned the world of people. Janine volunteered to cut them out . Janine's Day Care service is in a home rented from one of the parents. It has been made secure and inspected to ensure that it complies with all safety, care and educational requirements. We soon met the children and were shown around. "Come and see our school bus, you steer it from here". "This is my fairy garden that I'm making". "Look I can hide in here". The building was filled with resources and materials that the children could choose pretty much when they wanted to. There was maximum freedom to move from one zone to the next with the children setting much of the agenda for learning. 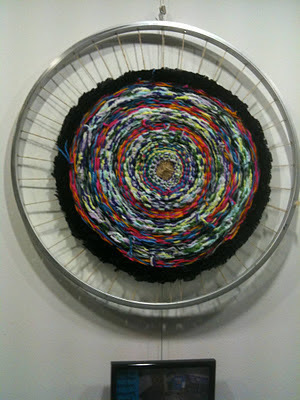 Janine shared, "my job is to listen well, and build on their ideas and interests". The Day Care Centre at Boat Harbour demonstrated many of the things I had spoken about at the launch of Children's Week. Here was a place for children to feel secure, but also a place to learn and interact with others. Janine had created a learning environment where children challenge and enrich each other with their ideas. This is a place where communication, storytelling, creativity, science, maths, play and fantasy are integrated as children explore things together, and develop confidence and self awareness in a secure and supportive environment. 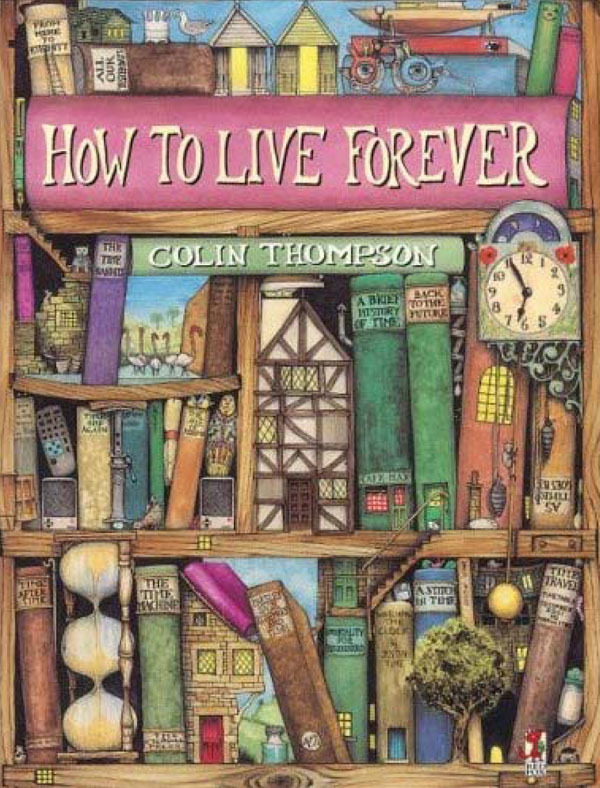 Like many people born in other lands, Colin Thompson is now a person we Aussies claim as our own. 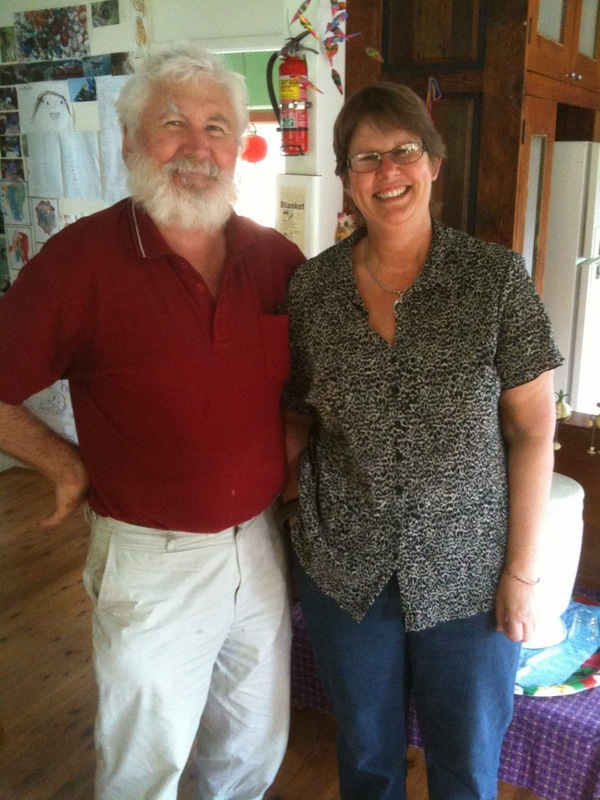 He was born a Pom (the name we affectionately give to people from England) but moved to Australia in 1995 after falling in love with both Australia and a teacher librarian who organised a visit by him to her school in Sydney. He came back to live just two weeks later and eventually married her in 1999. They moved to Bellingen in northern NSW and, eventually Colin became an Australian citizen. Colin was born in Ealing (London) on the 18th October 1942. He went to boarding school in Yorkshire, grammar school in West London and then had two years at art school in Ealing and Hammersmith, where in his words he '...met people who could draw better than (he) could'. He met his first wife at art school and went on to work in varied ways in the arts field. This included work as a silk-screen printer, graphic designer, stage manager, potter and film maker. 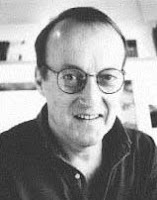 He didn't begin writing and illustrating children's books until 1990. He suffered terrible depression in his early twenties and on three occasions spent up to three months in different 'mental hospitals' (as they were called then). Inexplicably, the depression disappeared when he was aged 25 and has never come back again. 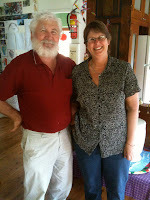 Colin has published about 60 books, including 7 poetry books, 9 novels and as best I can estimate 35+ picture books. In this post I intend to review only his picture books. You can find out more about his personal life on his website HERE. 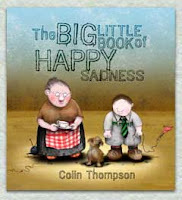 Colin Thompson's picture books captivate children aged 5-12 years and even adults like me. 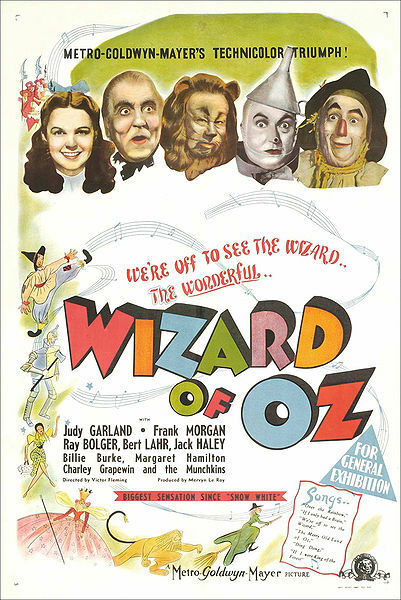 In fact, at times, he could be criticized for playing a little too much to the adult audience. His work is also seen by some as just too 'out there', different. But what I like about Thompson's work is that you never leave it without challenges and questions. At times, I wish he'd produce fewer books and take more time with some of them, but his prolific publishing and risk taking is also a strength. As a result of the unusual nature of some of his work, it is hard to put an age range on his books. But this is something he has in common with many outstanding children's authors and illustrators. As well, Thompson's work cannot be easily put into a single genre, for he writes varied material including science fiction, fantasy and straight narrative accounts. There are lessons in all his books for adults, teenagers and little kids. It always seems as if Colin has a big point to make. But lest we think Thompson has a set ideology to push, we might note his admission when commenting on his famous character Riley (the mouse), that "Riley's philosophy of not wanting what you can't have is good, but it's difficult to accept. I have tons of things that complicate my life, and I'm constantly on my computer, so I have yet to fully learn Riley's simple ways!" He presents his stories with multiple layers in word and image that challenge us to consider what we might learn from the tales of his characters and their situations. 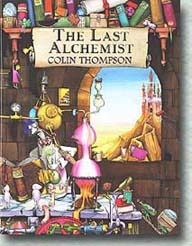 Some of these works have been written and illustrated alone, while others have been collaborations, with Colin as the author and others as illustrator. It is challenging to review his work fully, but I'll do my best to cover some of it. His first two books were published in 1990 by Hodder & Stoughton - 'Ethel The Chicken' and a 'Giant Called Norman Mary'. They are out of print as separate titles but are available in a collection called 'Wild Stories' (Kane Miller publisher). 'The Paper Bag Prince' was published in 1992. It is the story of an old man who lives in a derelict railway carriage at the edge of the town dump in the company of birds and animals that have come to live there. The local people and social workers think he is mad. But The Paperbag Prince wins out in the end, proving that Nature, left alone, will triumph over man's destructive abuses. 'Pictures of Home' (Random House, 1992) - This is a series of pictures of homes with haiku verses and comments from a group of ten and eleven year old children about what home means to them. 'Looking for Atlantis' (Random House, 1993) - This is a story about a ten year old boy who mourns the death of his sea-fearing grandfather. 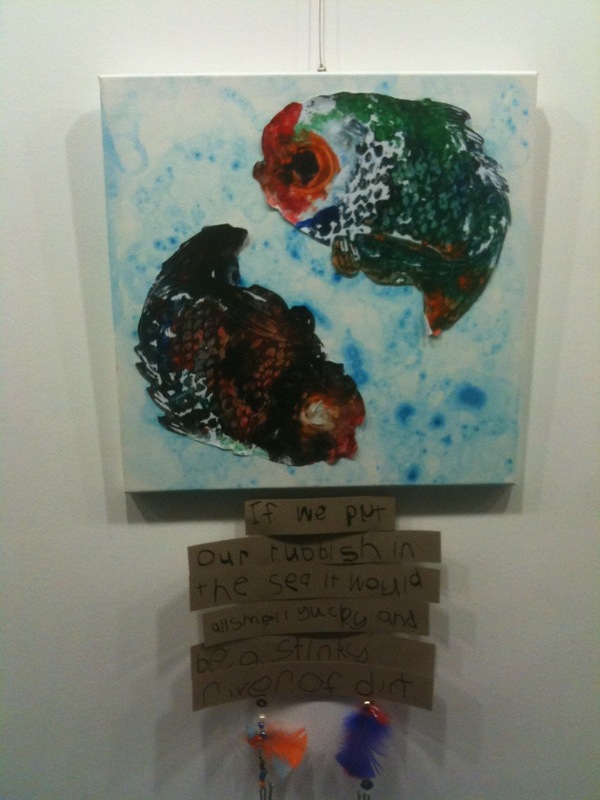 As he lay dying he leaves the boy a parrot called Titanic and a wooden ship's chest. He tells the boy "Everything you could ever want is in the chest if you know where to look for it". He tells his grandfather that he wants him to be well, "I will be," he said closing his eyes, "when you get to Atlantis". The boy exclaims that he thought Atlantis was just a story. His grandfather replies, only to "...narrow-minded people... Atlantis is right here, all around you". 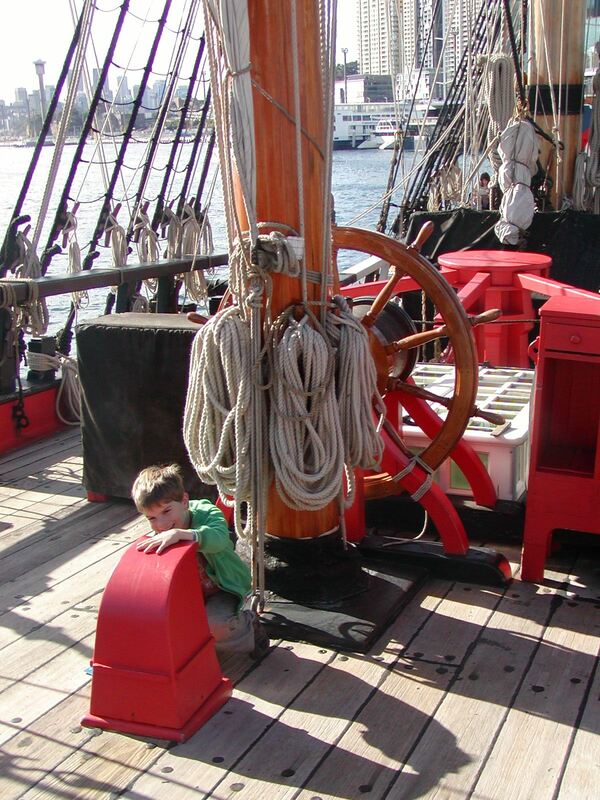 His grandson begins to search through the treasure that is hidden in the sailor's old wooden chest. Gold coins, diamonds and silver stars are all there but the boy is looking for something greater still. Will he ever find it? He makes a surprising discovery. The illustrations in this book have immense detail that can be plumbed for many hours. The real and the metaphysical world are held in a delightful balance throughout with hints along the way to his Grandfather's secret. 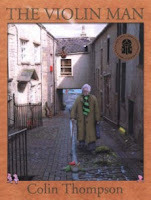 'Ruby' (Random House, 1994) - In the roots of an old tree lives a family of tiny contented people. Their peaceful existence is shattered by the arrival of a ruby red Austin 7 and a picnic party. The car proves an irresistible trap that carries the family away to a dangerous adventure and a new life. 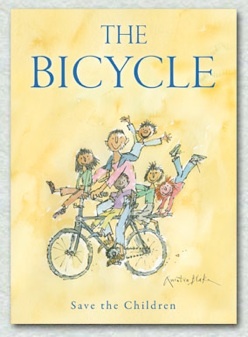 The book won the 1994 Primary English Best Picture Book Award in the UK. 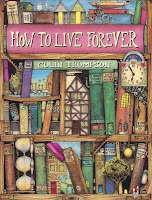 'How to live forever' (Random House, 1995) - In a library with a thousand rooms are copies of every book ever written. But one book is missing and it is called 'How to Live Forever'. But why it is missing, and how can it be found? At night when the library is closed and all is quiet, the shelves come to life. Doors and windows appear on the shelves and the backs of books and the 'sound of voices drift out between the pages'. Peter discovers the fact that one book is missing when his cat Brian chases a mouse into the filing cabinet, the card is found hidden, but alas, where the book belongs is simply a dusty gap on the shelves. Perhaps, he concludes, if he could find this book the secret of eternal life would be his. He embarks on a labyrinthine journey, in which books are to play a vital part, as he searches for the book and discovers 'The Ancient Child' who holds the secret. 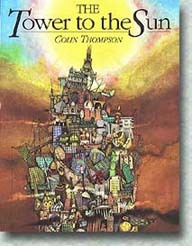 'The Tower to the Sun' (Random House, 1996) - Once again Thompson deals with big issues in the most disarming of ways, the future of the world is seen in this tale in the wake of man's foolish misuse of resources. The richest man in the world looks out across the city and sees a yellow sky, dull light and no visible sun. "When I was your age," he says to his grandson, "the sky was so bright you couldn't look at it." But the boy could not know what he meant, for now there was no blue sky, no sun. 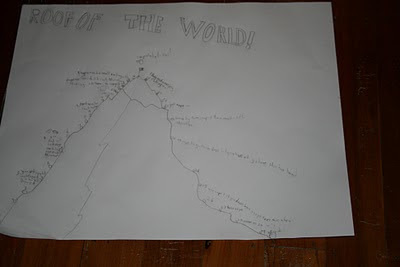 The boy suggests that they build a great balloon to float up above the endless yellow cloud that surrounded the earth. His grandfather does so, but after three days and nights the fourth day dawns and the balloon can rise no farther. They return to earth and the richest man in the world decides he has to see the sun one last time. So they begin to build a great tower on top of the world's largest rock. Twenty years pass by and still the tower has not reached beyond the cloud. It must do so before the old man dies. At last, the tower does its job and the old man and his grandson emerge into the sunlight of the old man's youth. His legacy is complete; a means for the whole world to find a passage to the sun has been found. 'The Paradise Garden' (Random House, 1998) - In the quiet of a great garden away from the noise and fumes of the city, Peter finds the peace and contentment that is missing in his life. Yet just as summer turns to winter, so must Peter return home. But his Paradise garden goes with him. 'The Last Alchemist' (Random House, 1999) - A 19th century alchemist named Spinifex, must discover the secret of turning base metals into gold before the dawn of the new millennium or he is finished. His schemes, growing wilder at each attempt, finally result in a monstrous machine, driven by the power of the sun. Will Spinifex succeed where all others have failed or will the secret of gold remain a mystery forever? 'Falling Angels' (Random House, 2001) - Falling Angels is the story of a girl who can fly. Sally could fly even before she could walk and she thinks she's the only one who possesses this power, until she finds out that her grandmother once flew too. The book won the English Association Picture Book Of The Year and was also selected as the UK's nomination for the next IBBY Honour List in 2002. 'The Violin Man' (Hodder Headline, 2003) - Oscar had played his violin outside the theatre for as long as anyone could remember. Every night, as the people queued for their tickets, Oscar filled the air with his music and the echo of his lost dreams. In those dreams, he was the greatest violinist who had ever lived, and his young daughter Marietta, now long gone, was the greatest ballerina. Oscar loses himself in the music of his violin. Colin Thompson uses computer imaging to create a wonderful work that mixes photos, drawings, and images to tell this touching story. 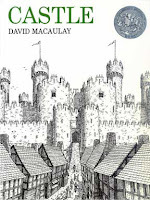 'Castles' (Random House, 2005) - This book has no narrative, just images of fantasy castles and descriptive paragraphs that hint at the inspiration for seeing castles in unusual places. A castle made of musical instruments on a mountain in Patagonia, a castle of pink mushrooms springing up along his shady path, a red castle hidden on the winter side of Mars, a castle in the glowing embers of his fire, a cold potato castle on his plate, and more. 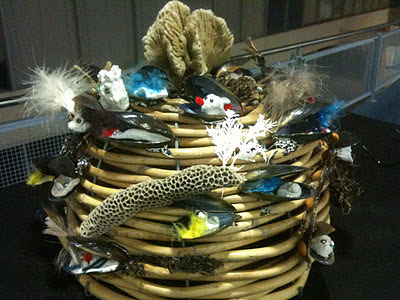 Whimsical and creative, and just a tad quirky, as we have come to expect from Thompson. This book is an example of a book that encourages children to imagine in the midst of the ordinariness of life. 'The Big Little Book of Sadness' (Random House, 2008) - George is a sad little orphan, who lives with his grandmother but feels alone. He has a chasm-like gap in his life, left by the loss of his parents. But one Friday as he heads home from school he visits an animal shelter. In the last cage he finds Jeremy, a sad dog as lost and alone as George feels. Jeremy takes him home, and George and his grandmother find that life changes. 'Sometimes Love is Under Your Foot' (Scholastic, 2008) - Kevin is a dog who loves his owner Brian so much that he thinks Brian is God. But Brian usually ignores Kevin, except when he nearly treads on him in his big shoes before sending him outside. This is the story of how George comes to appreciate Kevin and the love that he has been blind to all along. 'Free To a Good Home' (Random House, 2009) - Most people don't like being different, they want the same things as their neighbours, or perhaps, a little more. But the Smiths are not like ordinary people. In their jumbled house of things that might come in handy one day, they are happy and content. But the Smiths feel that there is something missing from their lives before their children go to the shops and find it. 'The Naughty Corner' (Hachette, 2011) - No one likes to spend time in the naughty corner. Little George makes frequent trips for saying a naughty word (57 times in the savoury biscuit aisle alone). His brother Peter gets sent to the naughty corner too for teaching George to say it, and of course it was their Dad's fault anyway. And so it goes, little baby Cleopatra ends up there for eating things off the floor, and the dog for just being smelly. But could Mum ever end up there? 'Barry' (Random House, 2011) - This is Thompson at his most quirky. Barry came to earth in 1952 and unfortunately became stuck down the back of a sofa with no means of escape. His alien friends were terrified of cockroaches so they fled back to their planet. Poor Barry. He might be small, but he has a very large brain (mostly stored on his home planet). While trapped in the back of the sofa, he controls the world. He even controls the sun and rain, floods and drought, war and peace. Weird stuff happens everywhere while Barry is trapped - the Loch Ness Monster, the Bermuda Triangle, Bigfoot and even 'Australia's Got Talent'! Barry survives mice, a baby's grasping arm and then after 50 years a human hand pulls him out, with interesting consequences. Visually, 'Barry' is stunning, and is a tale with a level of silliness that children adore. My only regret with this book is that the text could have benefited from some more editing. It is just a little too sparse in places for me and could have had more impact with more work. The book also seems to play too much to adult readers. 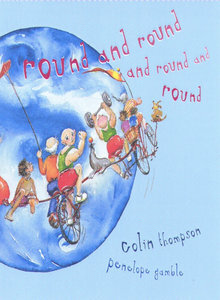 Colin Thompson has also written a number of picture books that others have illustrated. I have tried to present a comprehensive coverage of these books. This has been possible for some, but not others. Where it hasn't been possible I have used the author or publisher's short descriptions. 'Sailing Home' (Hodder Headline, 1996) by Colin Thompson, illustrated by Matt Ottley - Peter's family wakes one morning and discovers their house is adrift in the middle of the ocean. This is the start of a wonderful adventure. Out of Print. 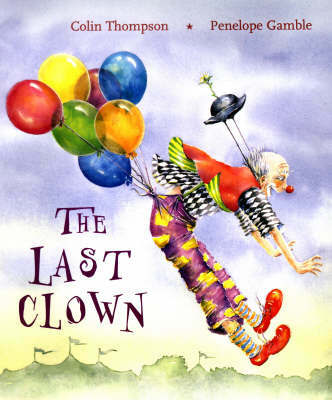 'The Last Circus' (Hodder Headline, 1997) by Colin Thompson and illustrated by Kim Gamble - When the circus where Oscar the Clown has lived all his life closes down, he sets off through the countryside to find his best friend, Rosie the elephant. 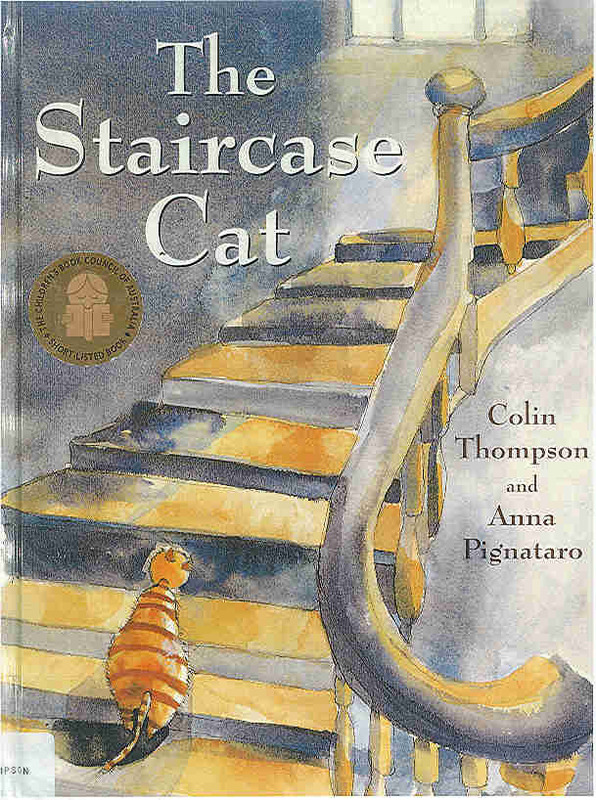 'The Staircase Cat' (Hodder Headline, 1998) by Colin Thompson and illustrated by Anna Pignataro - Oskar is a cat who lives with a caretaker and his family. One day war comes to their city. Bombs fall, and tanks rumble along the streets. Everyone begins to disappear, and Oskar waits in the deserted building for the people to return. Years pass and the town gradually returns to life, but Oskar's family does not return, until one day, a young woman walks into the old building. The book was shortlisted for the 1999 Australian Children's Book Council (CBCA) picture book of the year award and the Yabba Award. 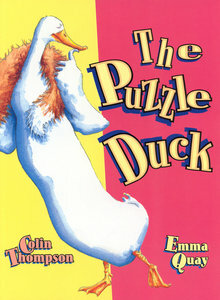 'The Puzzle Duck' (Random House, 1999) by Colin Thompson and illustrated by Emma Quay - The Puzzle Duck is always answering questions and has become a bit of a guru. But her advice is more imaginative than accurate! She tells her sister that the trick is to believe the answers yourself even if they're not true. They will make people happy. When a fox comes to her pond, her life is spared when truth is there to save her. 'Unknown' (Hodder Headline & Walker Books, 2000) by Colin Thompson and illustrated by Anna Pignataro - When a ferocious fire breaks out at the dog pound, it is the smallest and most unwanted dog who saves the day. 'The Last Clown' (Hodder Headline, 2001) by Colin Thompson and illustrated by Penelope Gamble - Zippo is a clown and is the oldest person in the circus. When he retires, there will be no more clowns to follow him. Then something happens to Max the circus's youngest tightrope walker, something that makes sure there will always be clowns to make the world laugh. 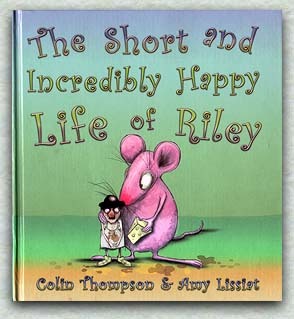 'The Short and Incredibly Happy Life of Riley' (Lothian Books, 2005) by Colin Thompson and illustrated by Amy Lissiat - Riley is a very happy rat. He was born happy to a short and simple life filled with happiness. He lives his life in the moment enjoying simple things. Thompson's point is obvious. We humans often want more, always wanting something new. Thompson asks the reader, who is smarter? Us, or Riley? 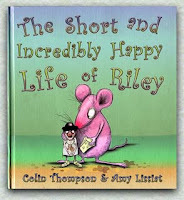 Riley like all rats, lives just a short time, and yet he is happy leading the simple life. It's certainly a message for our times. 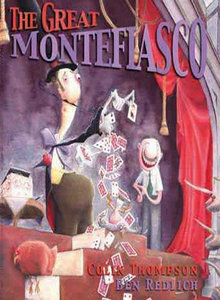 The book won the 2005 Children's Book Council of Australia Picture book of the Year. 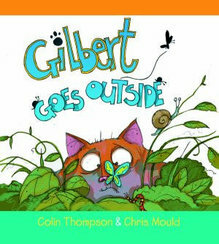 'Gilbert Goes Outside' (Lothian Books, 2005) by Colin Thompson and illustrated by Chris Mould - Gilbert makes a return in this book with more adventures for the world's most nervous cat as his Mum takes him to a scary place - the garden! 'Norman and Brenda' (Lothian Books, 2006) by Colin Thompson and illustrated by Amy Lissiat - While some people are seemingly born popular, successful and beautiful and, can face the world with confidence, not so Norman and Brenda. They need to get these things through determination, talent and cosmetic surgery. 'DUST' (ABC Books Australia, 2007) was written by Colin Thompson and illustrated 13 different illustrators - The book was inspired by a natural disaster in Niger, the starvation of thousands of people. 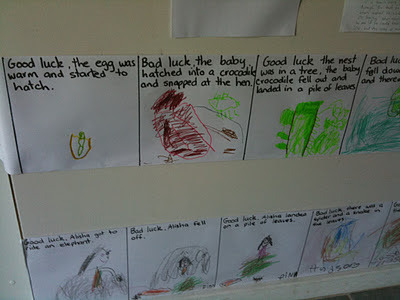 Thompson decided to organise this book to raise money for the Save the Children Fund. 'DUST' is a 32 page picture book with simple story and 14 double page illustrations, each by a different illustrator including himself. It is a confronting book that tells a true story to inspire all of us to action. It was named as an Honour Book in 2008 CBCA Picture Book of the Year Award. For more information on the fundraising quest visit the site HERE. 'Fearless' (ABC Books Australia, 2009) by Colin Thompson and illustrated by Sarah Davis - When a new baby is born it is difficult to tell if it will grow up to be big or small, or even brave or scared of the dark and spiders. So sometimes babies get the wrong name. It can be the same with dogs. So when the Claybourne-Willments, who should have been called the Smiths, got 'Fearless' as a little puppy, it seemed a good name for him. Except Fearless wasn′t fearless! How will Fearless finally live up to his name? This book has been very popular with children and has won six awards - The CBCA Junior Judges Children's Choice Award, The KOALA Award, The YABBA Award, The COOL Award and the KROC Award. 'The Bicycle' (ABC Books Australia, 2011) by Colin Thompson and illustrated by 15 different illustrators - This is the second book Colin Thompson has written to raise money for 'Save the Children'. 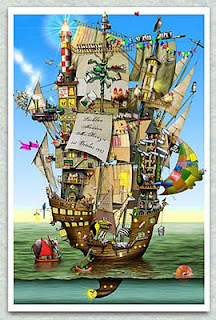 Its illustrators include Shaun Tan and Quentin Blake! While 'DUST' was graphic and sad, 'The Bicycle' is a happy celebration that offers hope. I have written previously about 'Digital Storytelling' (here), but in this post I want to mention several excellent resources that help children to understand and experiment with film and animation as a vehicle for storytelling. Story is important! I talk about this in a series of previous posts titled 'The Power of Story' (here). Narrative is an important part of what it means to be human. Across all cultures, story seems to be a key way that people share something of who they are, how they see themselves, how they envisage the past, present and future. Story can entertain, build community, develop shared cultural understanding, maintain culture and social groups, help to shape identity, and help us to interpret the past, present and future. A narrative is a story created in varied forms, including writing, speech, song, art and images, sculpture, video, dramatic presentation, dance, mime and so on. While the modes used can vary, what is common is that a narrative describes a sequence of events that can be works of fiction or non-fiction. Story is based on the Latin verb narrare, which means 'to recount', translate or tell. The purpose of story is so enable us to learn, know, remember or share knowledge. We often used the word 'story' to refer to the sequence of events that are the focus, but it can also be used interchangeably with 'narrative'. 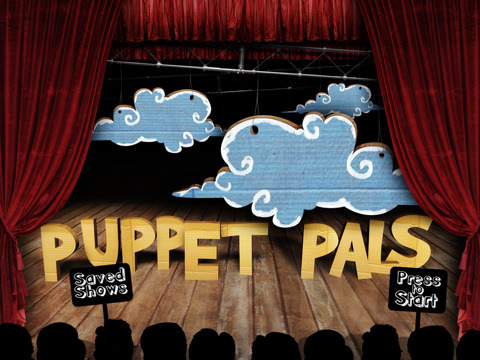 Puppet Pals is available as a free app for the iPod Touch, iPhone and iPad. It is essentially a simple way to create an animated movie using 'cut-out' themed characters and a variety of backdrops and scenes to create an animated 'puppet' play. 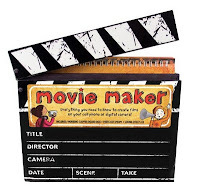 'Movie Maker' was developed by Tim Grabham, Suridh Hassan, Dave Reeve and Clare Richards. 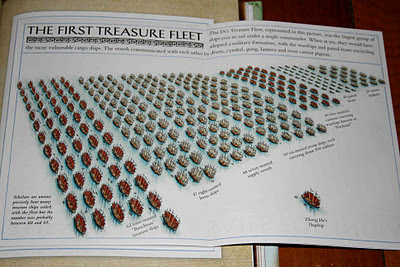 It is another wonderful resource from Walker Books designed for primary school aged children (7-12 years). It is a kit that contains ideas for making movies, a handbook that shows you how armed with a simple video camera you can make movies. The handbook talks about techniques like storyboarding, production, equipment, sound and lighting, design, special effects, how to vary camera shots and so on. It also includes some very cute aids such as a binocular mask, an adjustable frame, sample story boards, character props (e.g. glasses, moustache) and even authentic theatre tickets. All it doesn't include is the popcorn. 'The Klutz Book of Animation' by John Cassidy and Nicholas Berger is another excellent aid for child film makers. The book provides step by step guidance to primary aged children to make simple animations using a video camera (as simple as a web cam) and computer and a variety of props, objects, plasticine and so on. The publishers provide a number of videos online that teach children the fundamentals of animation and film making (here). At the publisher's site you can download free instructional videos (here), free sound effects (here) and sample videos made by children (here). 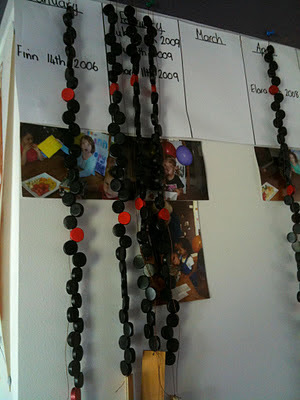 Below is a sample using the Klutz methodology. This is a great resource for young film makers. Steven Spielberg would have loved to have this as a child. 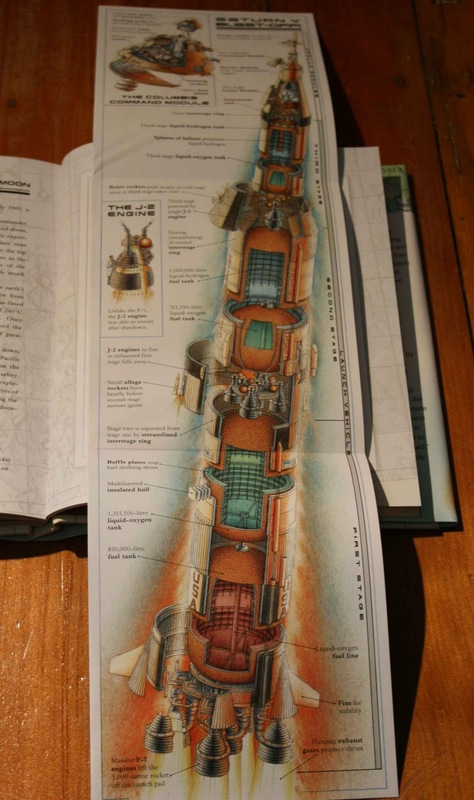 I was reading one of Stephen Biesty's most recent cross section books with my grandson aged 9 (almost) the other day - 'Into the Unknown' (2011) illustrated by Stephen Biesty and written by Stewart Ross. It is published by Walker Books. It has to be one of my favourite books of this type. 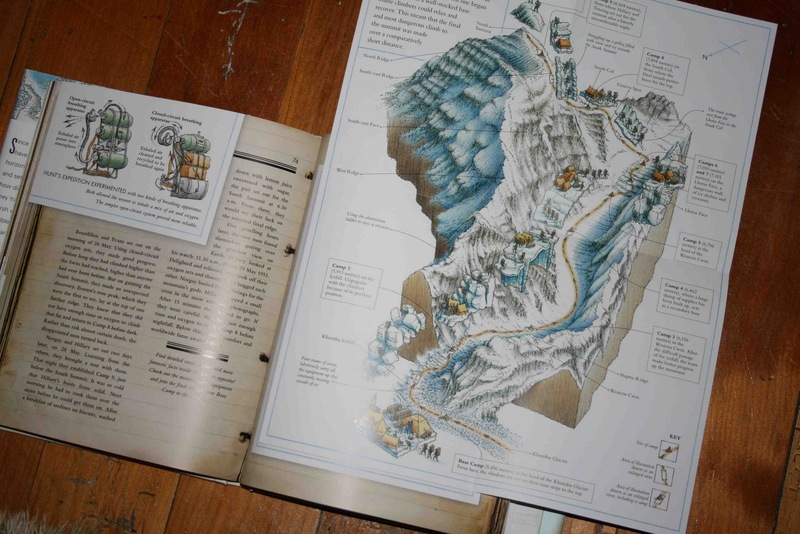 The book is a wonderful collection of stories and cross sections of 14 'Amazing Journeys'. The journeys include the epic travels of Marco Polo down the Silk Road to China in 1271-1274, David Livingstone exploring the Zambesi in 1858-1864, Captain Cook mapping Australia and the Pacific in 1768-1771, Umberto Nobile flying over the North Pole in 1928, Jacques Piccard's travels to the top of the Stratosphere by balloon in 1932 and then by submarine to a depth of almost 11,000 metres in the ocean in 1960. It is suited for boys (and some girls) aged 7-14 years. As a child I loved books with cross-sections, maps and detailed diagrams or drawings - bodies, buildings, vehicles, the Earths' crust, mummies and so on. 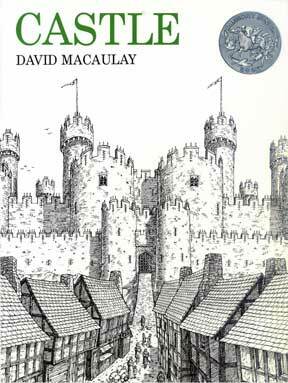 David Macaulay's books, including 'The Way Things Work', 'Castle' and 'The Way We Work', are other excellent examples in this genre. My recent post 'Making Reading Exciting for Boys' covers some of this wonderful material. But why do they work? Cross sections teach you things - A cross section of a mountaineer's clothing and equipment gives an immediate sense that climbing Mount Everest must be VERY cold, heightening the sense of this amazing achievement. Jacob already knew about Sir Edmund Hillary and Tenzing Norgay and the first ascent of Mount Everest in 1953, but seeing Biesty's drawings made concrete many of the things he heard or read previously, and opened his eyes to others he didn't know. Cross sections stir the imagination - They encourage boys (and girls) to come up with their own ideas and to represent the learning that has been stimulated in new ways. As soon as Jacob finished reading the book with me he raced off to find some cardboard to make up his own board game of the Hillary & Norgay ascent of Everest. We then had to play it and 'relive' the journey through the game. It had many novel elements. For example, if you failed to land on the spot where you received a critical rope you were doomed not to make the descent safely. Spontaneous child-initiated activities of this type enrich the experience of the book, stimulate the imagination and reinforce learning. Cross section books encourage boys (in particular) to revisit - A good cross section book will be looked at time and time again, and each time it will fire imagination and increase the desire to learn once again. Even at my age, I never tire of revisiting diagrammatic representations of Apollo 11 and the first moon landing. The experience of growing up during the space race and seeing the Apollo 11 landing live, was one of life's great memories, and it floods back with new richness with Biesty's images. 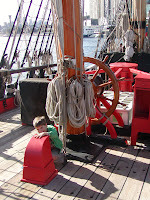 Cross section books also help you to enrich and enliven previous learning & experience - Jacob and I had the chance to see and crawl through an exact replica of Captain Cook's famous ship the 'Endeavour' when he was six. As we looked at Biesty's cross section of the book yesterday we recalled where we had climbed, how low the roof had been and speculated about the exact location of the Captain's cabin. Books that incorporate diagrams, cross-sections and maps have special interest for boys as readers and learners. They encourage them to read and use visual material to reinforce and enrich learning as well as stimulating their imagination and creativity. I would love to hear your recommendations for similar books. 1. 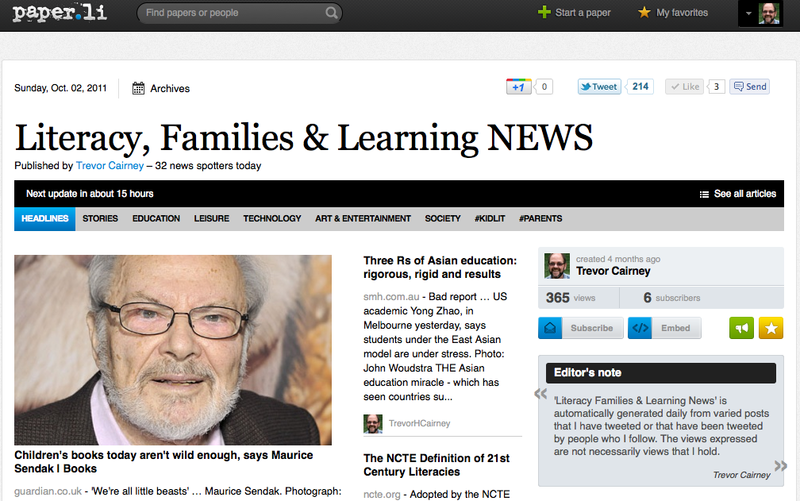 Watch the Twitter Boxes - You can simply watch either the Twitter box on the sidebar of this blog or the 'Literacy, Families & Learning NEWS' box that displays the content summary. The downside is that the tweets change daily (I tend to tweet once or twice per day in short bursts) so if you only visit once a week you will have missed lots of links. 2. Subscribe to the Online Newsletter - The second way is simply to subscribe to my daily newsletter that offers a spread of the links as stories in the form of an online newspaper, with sections like 'Top Stories', 'Kids Lit', 'Education', 'Technology', 'Parents', 'Leisure' etc. It also has direct feeds for video and photos. 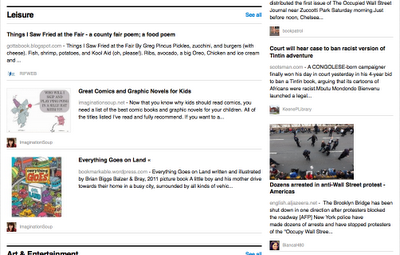 The newsletter includes most of my tweets plus some of those from people who follow me. It is generated automatically each day and can be accessed like any blog or website and read as a newsletter online. 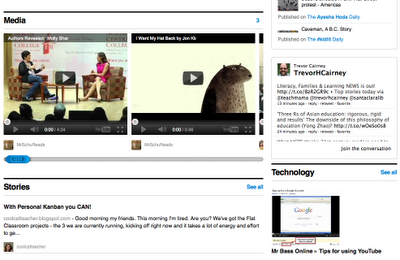 The screenshots above and below show just part of the newsletter for today. 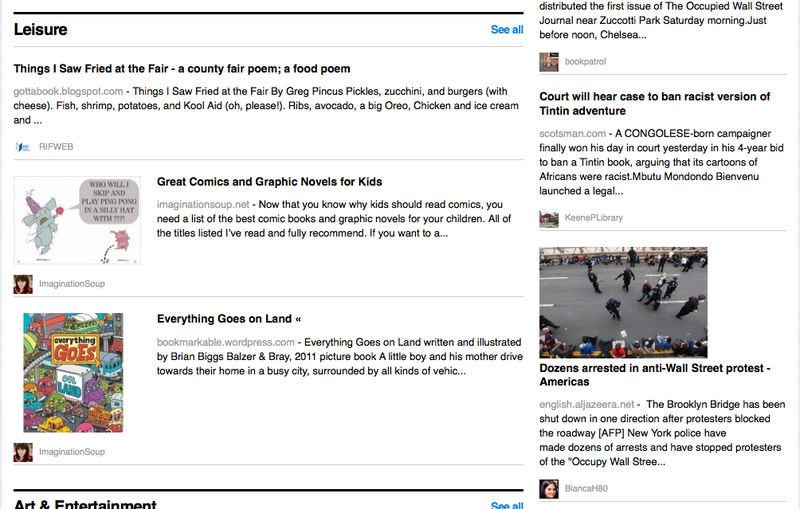 Each edition has varied sections that reflect tweets in the last 24 hours. It's easy to subscribe by email, or by using the display on the sidebar of this blog. You can also subscribe once you've reached the newsletter just like you do for any blog (HERE).